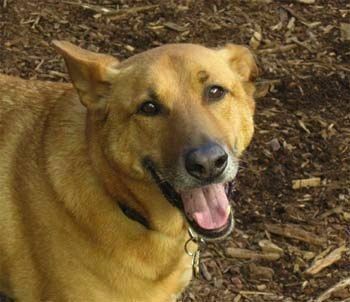 Fromage died on Saturday, May 12th 2012 at 11:30 p.m. at All Animals Emergency Hospital, surrounded by us and our love. He was dehydrated and disoriented, with a temperature of 105.6. Normal temperature for dogs is 101-ish, with 102 being in the high fever range. So Fromage had a raging fever, probably from a combination of a brain tumor (or nervous system tumor) and end-stage kidney disease. We knew it was serious when he couldn’t do anything with a Beggin’ Strip — his favorite treat in the universe. And I’d dreamed Wednesday morning that he died. I knew it was a precognitive dream, but I didn’t know how or when the end would happen. He did his utmost to stay alive for me — to support me and love me through this disorienting chapter of my life. He showed the same heroic courage and love he had shown us all his life. He was an impeccable warrior to the end, but in the end it was time to let him go. It was the night before Mother’s Day. It’s the little things that really punch me in the gut — the moments that interrupt my conditioned habits, such as automatically tucking the newspaper bags into the plastic bag collection next to the front door, only to realize that I don’t have a need to save dog poop bags any more. I put his sterling silver tag on a chain and started wearing it around my neck last night as I went to bed. He was the only being who has ever called me his mother. On our first Mother’s Day he bought me a pair of dog socks. He was the dog of my life. He was the dog of my heart. I somehow left my favorite fountain pen at school on Friday, but I was too stressed-out and worried yesterday to deal with it. But this morning, all I wanted to do was write, so I drove down to school and back to retrieve it. When we got to All Animals, Fromage had a fever of 105.6. This was a raging brain fever. He couldn’t even walk down our front stairs. I carried him in my arms down the thirteen front steps — all 60+ pounds of him. David carried him into the car. He was dehydrated and disoriented and scared. He was dying. I held him in the back seat while David drove. He lay quietly on the back seat, watching where we were going. He had kept himself alive so he could support me. And now I knew it was my turn to support him by letting him go and by easing his passage into the next world, into his next life. Fred always said that Fromage was my spirit guide. Now my heart just aches. David’s too. Fromage loved David so much, even though David felt hurt that Fromage was always so freaked out and demented these last few years. David hugged him and loved him too, even though there was so much dog hair. By last night, no one cared. I can’t put away his old beds or mats yet. I am still processing the fact that he is gone. There is a giant Fromage-shaped hole in my heart — one with one stand-up ear and one flappy ear. The stand-up ear is his right one. It has a bite taken out of the tip. My lips and fingers know the shape of that missing spot instinctively. Completely. Like a fingerprint. He’d been staying alive to get me through this tough time. On Wednesday night I got the word that my layoff notice had been rescinded. He went downhill fast from there. I loved that dog so much. He loved me more purely and wholeheartedly than I had ever been loved before. It was a healing kind of love. He healed me. He made me whole. When Crystal and I saw Mary Oliver the first time at the Herbst a few years ago, Mary had recently lost her longtime partner, Molly Malone Cook, and had been writing about it for some time. A woman in the audience asked how she’d gotten through the devastating loss. “Well,” she said, first you go a little crazy. You go nuts for a while.” That thought comforts me now. I am going to have to go a little nuts for a while while I grieve. It’s also tinged with fear and shame that I might not be experiencing appropriate gratitude for the gift of his life. I *do* feel a bottomless gratitude for his life. It’s just that right now, this is the part where I have to take in and let out the hurting — the loss and the groundlessness of impermanence. In legal terms, I rescued him, but the emotional truth is that he is the one who rescued me. He was a magical dog, a magical creature. In mythical terms, he was my magical helper-being. “A dog lives fifteen years, if you’re lucky,” Mary Oliver writes in one of her dog poems. In so many, many ways I’ve been very, very lucky. Fromage was in good health and good spirits until this very last week. He enjoyed long walks and Trash Night and giving David five and ten and eating Beggin’ Strips until the very last day of his life. He watched for my return through the glass in the front door every single day of our life together. Then we left the treatment room and closed the door behind us. Fromage at the Dog Garden, Dog Garden, San Francisco, California, April 2004, photo © 2004 by Carlos Hillson. All rights reserved. About Elizabeth: Elizabeth Statmore is a San Francisco-based writer and teacher of writing and mathematics. She is a long-time practitioner and teacher of Writing Practice, which she learned from Natalie Goldberg. A frequent contributor to KQED-FM, Elizabeth’s last posts for red Ravine include Seed Starting, a piece about writers as gardeners, and Writing The “Remembering Grace Paley” Piece — a step-by-step tutorial on how she turned a raw piece of writing into a finished radio commentary. Elizabeth was also one of our first guest writers, contributing the post Abandoned Is… Fromage was her dog and spirit guide of almost fourteen years. Long is Part I in a series of three Writing Practices about the love and loss of Fromage. Five months ago I started a poetry and meditation group in my home. And I’ll tell you straight up: if I can start a poetry group, anyone can start a poetry group. I am not well read when it comes to poets. Before doing this, if called upon to name poets I would have only been able to tick off the most obvious choices: Robert Frost or Emily Dickinson. For most of my life I’ve felt intimidated by poetry. When I’d hear a poem read, I’d usually feel like I didn’t get it. I considered the door to poetry locked and bolted, entered by only a heady few. But at the beginning of 2008, I began to get an itch to do something to make the world a better place. I know, I know, such a cliché. But I was tired of feeling depressed by the sort of people and events that grab headlines. I was frustrated, feeling like my country was being taken over by things I didn’t like or believe in. I was worried that people weren’t reading like they used to. I wanted to do something to steer the world in the direction I wanted it to go. The idea for the group dawned on me one day, and I recognized it immediately as something I could pull off. I could invite people over to my house; we’d sit together for an hour, hear good poetry, and be still. And that’s pretty much what we do. It’s not a complicated event. Each month I pick out a poet. To do this, I browse in a bookstore or library, or go to an online poetry site. I like choosing poets from around the country and from varied backgrounds, but for the first meeting of the group, I picked a Nebraskan poet, just so we could get used to hearing poetry from a Midwestern voice. Since then, we’ve been to Massachusetts, North Carolina, California, and Virginia. I select poets whose words and voices are accessible. I live in a city with a sensational library system, so I get all the poet’s books with my public library card. I sit on my living room floor with books scattered around me, and slowly page through them. Certain poems jump out at me, and these are the ones I put a bookmark next to. The people in my poetry group have the option of helping me read, so I email them poems I’ve selected. This gives them the chance to practice reading the poems out loud before we meet. I do a little research on the poets so I can share a bit about their lives and what brought them to writing. I keep this short. I don’t think anyone wants an endless historic lecture. When we gather, I have candles lit. We get quiet, and I tell everyone what I’ve learned about the poet whose work we’ll hear. I don’t memorize this; I have it written on a piece of paper. I play a song to begin to slow us down, and then we listen to poetry. About one poem every five minutes with silence in-between. Sometimes I can find sound recordings at the library of the authors reading their own works. So at the end, we’ll listen to the writer reading a few of his or her own poems. So far, our poets have all been living. So we sign a card thanking them and telling them the titles of the poems we heard. I find mailing addresses online and mail the card the next day. Then we drink tea, eat snacks (I ask for a volunteer to bring treats), and hang around. That’s it. I feel a lot better adding something of decency and substance to the world. I am getting to know poets, and I am thrilled. If you say the name Maya Angelou to me, I’m tracking with you. If Rita Dove comes to town to read, I’ll be all over her work. Everyone who comes knows that for at least one hour every month they will get to be still in a busy world. After the Mary Oliver night, a 26-year-old from our group went and bought all her books. Three people purchased tickets to hear her speak when she came to Minneapolis last March. I’m pretty sure these things wouldn’t have happened if not for the exposure to her work. 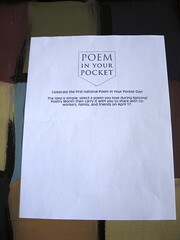 We got to participate in National Poem in Your Pocket Day in April. We wouldn’t have known about it had I not been searching poetry websites. Ted Kooser wrote to our group. I’m here to say I have a postcard from a two-time Poet Laureate and Pulitzer Prize winner hanging on my bulletin board. Not bad. The people who come range in age from 26-55. It feels healthy to be in a cross-age group. Hosting these evenings is part of my writing practice. It is a tangible way to move my life in the direction I want it to go. The people who come seem genuinely happy to participate. Someone told me this morning that it feeds her soul. On Gary Soto night, a young group member (a Spanish major) read her poem twice, first in Spanish and then in English. It was deeply touching to hear another language spoken; it brought tears to our eyes. I don’t know why it did, but it was good. Gary sent us a postcard, too. Part of it is written in Spanish. That Gary. After deciding that July would feature the poetry of Louise Erdrich, my friend and I saw her a few rows back on the same airplane when we were returning from a writing retreat. It was almost too much synchronicity to grasp. The sort of serendipity that makes your head feel dizzy and your stomach full of butterflies. When Robert Bly was named Minnesota’s first Poet Laureate, we swelled with pride. Poetry mattered to us. All that. And all I had was desire and a library card. 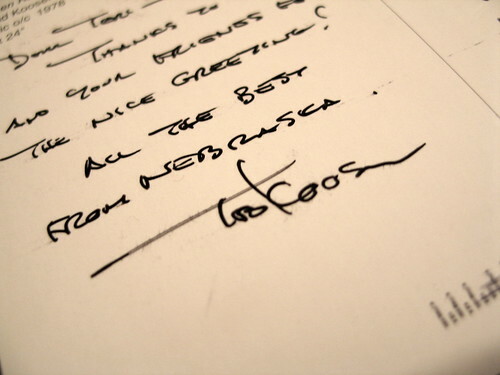 All The Best From Nebraska, postcard (back), March 2008, photo © 2008 by QuoinMonkey. All rights reserved. Golden Rule, postcard (front), painting by Ted Kooser, 1978, acrylic on canvas, 24″ x 24″, March 2008, photo © 2008 by QuoinMonkey. All rights reserved. Teri Blair is a freelance writer living in Minneapolis. She is currently writing a profile series on teachers who taught in one-room rural schools before, during, and after WW II. They appear monthly in Senior Perspective. the hard freeze, photos © 2008 by ybonesy. All rights reserved. My Uncle Bear died yesterday. I was at my daughter’s horse show when I got the call from Mom. Dad was crying too much to tell me himself. I wonder what it’s like to lose a younger sibling. I have no younger sisters or brothers myself, so I will never know that feeling. I imagine it to be different — very different — from losing parents or even an older sister. I imagine it’s like a giant swoosh of air, like a wind tunnel, where you experience everything that brother meant to you. Your childhood, your parents, your relationship to everyone else in the family. He was a jolly kid who made friends with practically the entire adult population in the neighborhood. He was always helping some neighbor with his fields, or his animals, or with house chores. People all around were always talking about what a hard worker he was and they were always after him to come help them. He was always willing. Cielito, Uncle Bear, Uncle Onofre. He went on to raise a large family. All his sons served in the military. Uncle Bear lived hard, smoked like mad, got Diabetes — the “silent killer” among Chicanos. Dad always says, given Uncle Onofre’s happy, carefree outlook on life, he should have outlived all the rest of them. But Onofre believed in living life to the fullest, and for him that meant not worrying about how long a life you lived, just that it was lived joyously. Dad called his little brother about ten days before he died. Onofre could still talk on the phone. “Hi, Cielito,” Dad said to Onofre. “Hi, Conde,” Onofre said back. “Cielito” means “little sky” or in a religious sense, “little heaven.” It captured in its wide blue umbrella all that was Dad’s little brother. 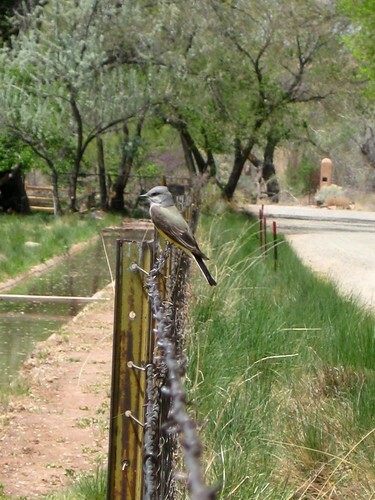 Tomorrow morning I’ll drive my mom and dad through Dad’s ancestral homelands of Taos and Costilla, to southern Colorado. We’ll attend rosary and services on Wednesday morning, visit all afternoon with cousins and other family we haven’t seen for years. We’ll laugh and cry. We might even sing. Just in his honor. Until then, I’d like to share these three poems that remind me of my light-hearted, hugable Uncle Bear. the corner to my son’s room. waiting for a bearhug. Grinning. give it that dark squeeze of death? all his small bones and his warm neck against me. locks to me like a magnet of blood. like that, before I came? every leaf on the whole mountain is aflutter. At first they were just clouds, like any other. like corn, or wheat, shining and useful. past few days, photo © 2008 by ybonesy. All rights reserved. Pocket Poetry, Minneapolis, Minnesota, April 2008, photo © 2008 by QuoinMonkey. All rights reserved. 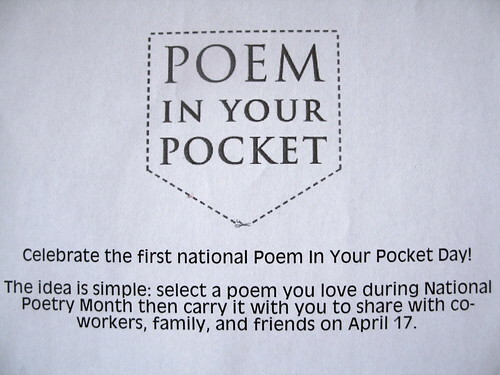 April 17th is the first national Poem In Your Pocket Day. It’s part of the wider celebration of National Poetry Month. I went to my monthly poetry group last Friday. We talked about the life of Maya Angelou, read her poetry, sat in silence between poems. We listened to her voice. This is the 3rd month we have met. The first month was Ted Kooser. After the group ended that night, Teri passed around a thank-you card (gratitude to those who came before us). We all signed it; the next day she mailed it off to Ted. A generous man, the former Poet Laureate and Pulitzer Prize winner wrote back within the month (look for an upcoming post). The second month was Mary Oliver. In March, three members of the poetry group went to see Mary Oliver at the State Theater in Minneapolis (here’s Mary with her famous dog, Percy, in Jim Walsh’s MinnPost article, The poet as rock star: Mary Oliver returns for a reading). They shared stories about the funny and engaging Pulitzer Prize-winning poet, who read to a packed house; Mary Oliver is one of the humblest and highest paid poets in America. April is the month we honor poetry as an art form. “Poetry” comes from the ancient Greek: ποιεω (poieo) meaning I create. It is an art in which human language becomes a palette for its aesthetic qualities. Poetry creates a visual feast from the simplest ingredients — it pares language down to the bare essentials. New York City is hosting its 6th annual Poem in Your Pocket Day (PIYP) on Thursday, April 17, 2008, with a series of events scheduled to celebrate the versatility and inspiration of poetry. The day was created to encourage New Yorkers of all ages to carry a poem in their pocket to share with family and friends. Now it’s going national. April 2008, photo © 2008 by QuoinMonkey. All rights reserved. My friend Teri, who started our poetry group, created and handed out Poem In Your Pocket sheets (above) after last Friday’s poetry group. We each copied a poem from over 20 poetry books sprawled over the living room floor. Copying a poet’s work, in my own hand on to a blank page, made it come more alive for me. Feeling brave? Write down a poem or haiku you have written, slip it into your pocket (the things we carry), and read it to some friends this Thursday, April 17th. For inspiration, listen to the great Queen Latifah’s version of Poetry Man (she got into rapping from writing poetry). Or maybe you prefer the original from Phoebe Snow (I wore a deep wax groove into Phoebe’s 1974 debut album, Phoebe Snow). Thanks to Teri, for starting a poetry group and inviting all of us to come along. And to all the poets who have been inspiring us since the beginning of time — thank you. It’s Tuesday evening. I’m not inspired. When I feel this way, I look to other writers and artists to pull me up. We’re all in this together. No need to compete. There is room for everyone. I’m a strong believer in abundance. I feel a spiritual obligation to pay it forward. I’m thinking about last May. Me, Liz, and two of our friends met for dinner at Acadia Cafe . We were just finishing our meals, when it started to pour. We ran across Nicollet Avenue through the pounding rain (without umbrellas), and sloshed across the parking lot, dodging puddles. When we finally slipped into a crack between two open doors, we were soaked to the bone: stringy hair, dripping palms, wringing wet. In the soggy line, we handed the smiling ushers our tickets, and stepped into an architectural dream. The place was packed, buzzing with energy. I’ve been meaning to write about that night ever since. But I just didn’t know what to say. Sometimes things have to sit inside a while. I have to hold them tight to me. Until I know what I’ve got. Angle, pipe organ, stained glass, inside Plymouth Congregational Church, night of Mary Oliver, May 7th, 2007, photo © 2007 by QuoinMonkey. All rights reserved. 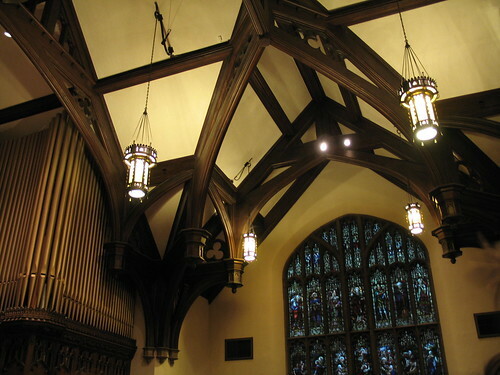 After a glowing introduction, and with a half-smirk that never left her face, Mary Oliver slowly walked up to the podium at Plymouth Congregational Church. Steady and sure, she had me from the first step. She was funny, witty, wise, and sometimes sarcastic. She made me laugh, something I highly value in a writer. She seemed to have lived a long, good life – a life not without sorrow. Liz took a few notes that night in a black, 8×10 sketchbook she had hidden deep in her pack. I asked her if I could take a look at it tonight, to help me unearth buried treasure. I chuckled when I saw a little thumb-sized pen and ink sketch of Mary Oliver in Liz’s notebook, near the left corner, by the spiral binding. It’s a great reproduction of the way Mary looked that night. I wish I could scan and post it. I carry everything the poet said in my heart. But there is something about looking at handwritten lists, thin-lined sketches, and short words on a long page, that jogs the memory. At the bottom were shards of memory, dots connecting the thin, wispy lines of Mary Oliver to snippets of words from the past. May 2007, Minneapolis, Minnesota, photo © 2007 by QuoinMonkey. At the end of her epic reading, we went out to the lobby to buy books for Mary Oliver to sign. I purchased a CD of Mary reading At Blackwater Pond. Liz purchased Owls and Other Fantasies. We had regretfully left Thirst at home. 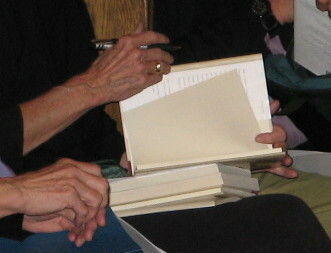 Liz walked up to the table, and opened Owls to an unconventional page for signing. Mary paused, a little taken aback. Liz was quick to recover. “I like this image,” she said. I spent a large part of last evening digging in the dirt, mowing the lawn, tying Liz’s Ecuadorian anniversary roses with dark twine into a neat bundle of 9 and hanging them on the porch, emptying vats of standing rainwater, ripe for mosquito breeding. I poked my hands into the slimy bucket and pulled out terracotta planters and cyan plastic garden pots that had fallen there. They’d careened into the abyss, a thrown out cat litter bin, over winter. I carefully held each pot up above the earth and let the water drip away, then stacked them one by one beside the shed next to the rusting Radio Flyer wheelbarrow and wagon. She said it belonged to her son when he was a kid. And she had used it for years and years to haul garden supplies and planting soil. But now it was time for it to go. One woman’s ceiling is another woman’s floor. We are happy to have it. And now use it to haul dirt in and weeds out of our own gardens. I worked up the first summer sweat last night, stopping periodically to wipe my forehead on the sleeve of my T-shirt. Bullfrogs sang in the distance, the orange sky purpled near 9pm, and I stood drinking a long swig of water out of a blue Taos Mountain bottle, watching Liz weed the garden near the juniper. I took macro shots of white bell-like blooms near the cactus. 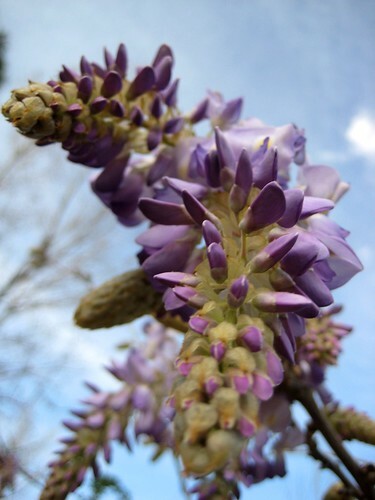 What’s the name of that plant? The lilac, so small last year, has bushed out and is pushing the limits of its ring of river rocks. We’ll have to expand the circle. Growth. It’s good to grow. When it came my turn to plunge the Sears mower through tall bottom grass soaked from last weekend’s rains, I was sure to take a big long whiff of the first cut grass of the season. I lovingly ran my hands through the clippings in the catch bag every time we emptied it into mulch. Old garden Skechers turned lime green from the chlorophyll dew. My hair was coated in bits of cut grass and creeping Charlie that Liz laughingly plucked from my head when we sat down to rest and drink a Mountain Dew on the gray steps under the mailbox. God, I love spring in Minnesota. Before the dog days of Summer, before mosquitoes and black flies, before humidity swells my joints and sweat drips from armpits on the short ride home from work. Before the day I was born, before wiry brown haygrass mixed with sparks from the barbecue signal fire danger, Code Red. Before Fall, there is Spring. Mary Oliver said she names a poem in almost every book Spring. She does it because she doesn’t like to think of titles for her work. I like to think she does it because she loves digging in the dirt and freeing juicy earthworms for the songbirds she so freely writes about in lucid, eloquent detail. I like to think she does it because she loves Spring. The Uses of Sorrow – What Is It About Obituaries? I’m thinking about poetry. 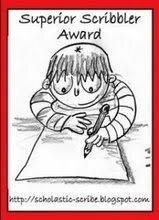 Our topic this week is to write a poem for Slam-o-rama. Poetry came easy to me last year. It poured out of me. I’m not saying it was good. Just that it poured. Like Morton salt. It seems tougher to write now. I have to slow down to write poetry. I am going to hear Mary Oliver read her poetry in May. Her partner of over 40 years, Molly Malone Cook, died in 2005. Thirst is dedicated to Cook. The pages are full of sorrow, quiet longing, and a search for faith. I wanted to know more about Molly Malone Cook, so I looked up her obituary. What is it about obituaries? The first is that we are born. And we shall die. When our time will come, we do not know. Cook continued to work as a professional photographer, making portraits of such luminaries as Eleanor Roosevelt, Walker Evans, Robert Motherwell and Adlai Stevenson, but her career was cut short by the breathing problems which were later to curtail her life: her lungs were unable to cope with the chemicals of the darkroom. Meanwhile, her relationship with the playwright Lorraine Hansberry – author of To Be Young, Gifted and Black and A Raisin in the Sun, the first drama by a black woman to be produced on Broadway (in 1959) – ended with Hansberry’s early death from cancer, aged 34, in 1965. Cook had met Mary Oliver in 1958, at the former home of the poet Edna St Vincent Millay in upstate New York – the two women having come to visit Millay’s sister Norma. Six years later Cook and Oliver moved into a Provincetown boathouse owned by one of the port’s Portuguese families, the Seguras. They travelled together on Oliver’s trips to give readings or classes, and spent several years visiting Virginia in search of Cook’s Southern roots – she was delighted to discover that her ancestry stretched back to Judith Jefferson, aunt of President Thomas Jefferson. That’s why we read obituaries. I wonder what mine will say? And who the writer will be.